Below is a step by step guideline to assist you in searching for an Arizona business entity. 1. Click here to go to the Search Page for finding registered entities in the state (it will look like the screenshot below). 2. You can conduct the search by Filing Number, Applicant/Agent Name, or Registered Name. Let's conduct a sample search by Registered Name. 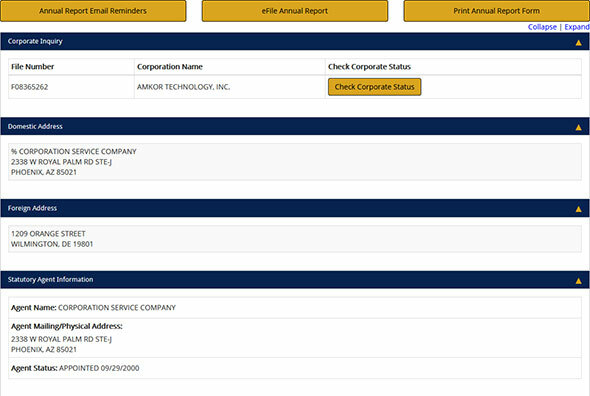 Let's type in "Amkor Technology" in the "Registered Name" field (see the screenshot below for reference). 3. Choose a radio button to select the type of search (see the screenshot below for reference). 4. Click on the "Search" button. The Results Page with a list of business entities with the name you typed in will then appear. 5. On the Results Page, click on the ID number to get further details on the entity. On the Results Page, you can file the business entity's online reports, as well as download its annual reports.For a small fee, you can also order a certificate of good standing for the business entity. 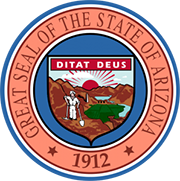 An elected state executive officer of the state, the Arizona Secretary of State is the keeper of the Great Seal of the State. The current Arizona Secretary of State, Michelle Reagan, was sworn into office in January 2015 and is currently serving a four-year term.